“E tan di. Tan tuo po di. Tan tuo po di. Tan tuo jiu she li. Tan tuo xiu tuo li. Xiu tuo li. Xiu tuo luo po di. Fo tuo bo shan mi. Sa pe tuo luo ni e po duo ni. Sa po po sa e po duo ni. Xiu e po duo ni. Seng qie po lü cha ni. “If a person merely writes out the Sutra , at the end of his life, he will be born in the Trayastrimsha Heaven. At that time, eighty-four thousand heavenly women will welcome him with all kinds of music. He shall immediately don a cap made of seven treasures and enjoy himself among the goddesses. How much the more will this be the case for one who receives, upholds, reads, and recites it, properly recollects it, explains its doctrines, and cultivates according to its teachings! When this chapter, ‘The Encouragement of Universal Worthy’ had been spoken, uncountable, boundless numbers of Bodhisattvas , as many as the Ganges sands obtained the Dharani of a hundred thousand myriads of kotis of revolutions. Bodhisattvas equal in number to the motes of dust in the three thousand great thousand worlds perfected the path of Universal Worthy. 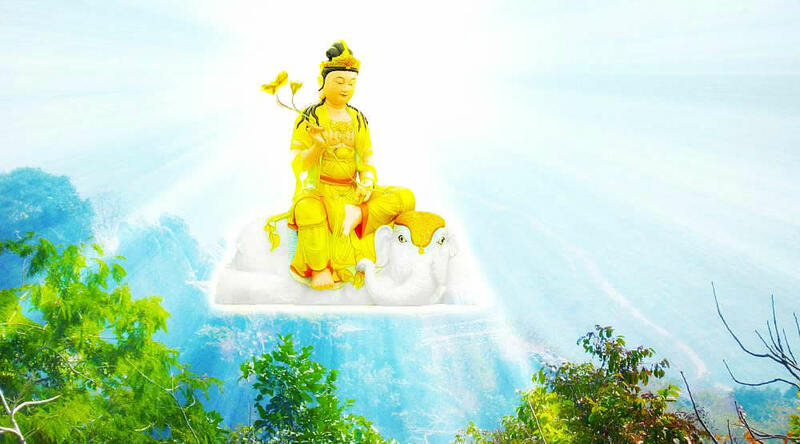 When the Buddha had spoken this Sutra, Universal Worthy and all the other Bodhisattvas, Shariputra and all the Hearers, as well as the entire great assembly of gods, dragons, humans, non-humans, and so forth, all greatly rejoiced, received and upheld the Buddha’s words, made obeisance and withdrew.